Earning the trust of manager Grant McCann is the number one priority for Posh midfielder Callum Chettle next season. The 20 year-old endured a frustrating 2016-17 season. 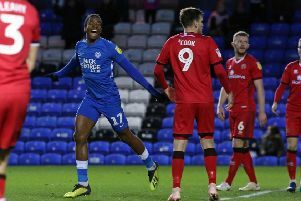 He started and finished the League One campaign as a regular member of the first-team squad, but from January to April he disappeared from view altogether. It’s an oddity Chettle is determined to put right next season after surviving a summer purge of unwanted Posh players. “It was frustrating at times last season,” Chettle admitted. “But that was down to me. “I was in and around the side at the start of the season, but then I stopped doing the things that had kept me in the squad. “I was pleased to get back into the side for the final four games and I played quite well, but it’s just a start. “I need to kick on next season. Earning the trust of the manager is something I need to work on. “I’ve come from a club (Nuneaton) where I was playing every week to a club where that won’t happen unless I’m on top of my game every week. “It was an advantage I believe to come from non-league rather than an Academy because at least I was already used to the physical nature of professional football. I played over 100 games for Nuneaton before I came here. “But I have to improve and progress. I had a great chat with the manager at the end of the season and he wants me to get into more advanced positions more often so I can affect a game more regularly. “I enjoy the way we play. “I like running with the ball at my feet, but I want to contribute goals and assists next season. “It’s nice to hear people saying how good I could become. It’s down to me to make it happen. Chettle was signed by previous manager Graham Westley from Nuneaton along with striker Aaron Williams. Williams has since left for Newport County. Chettle has made 20 appearances for Posh (15 of them last season), but only seven have been starting appearances. He has yet to score a Posh goal. The Posh players are due to return for pre-season training on July 1.